For many parents, a baby walker is a must-have item. The best baby walker will entertain your child and keep him out of trouble during the early stages of mobility. However, baby walkers are not uncontroversial. Despite claims to help children learn to walk, there is actually no evidence that demonstrates that effect. In fact, many healthcare and childcare professionals advise against using a baby walker for young children, citing dangers to their health and development. Want to keep your little one entertained? Safety 1st Sounds ‘n Lights Discovery Walker can get it done. It features multiple toys, lights, and 12 songs and sounds. There are five fun toys that spin, rattle, crinkle, and light up. Also included are swing-open activity trays that swing to the side leaving a large snack or play tray area. This walker comes with a machine washable padded seat, and it folds down flat for easy storage or travel. One satisfied user said this walker is built for tall babies with long legs, and has an adjustable height, while another said it is good on both floors and carpets, though better suited for a nine-month-old child. However, a dissatisfied customer noted that despite its decent construction and cute design, their baby’s legs won’t reach the floor regardless of setting. 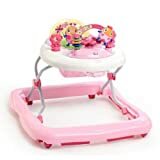 The Kolcraft Tiny Steps 2-in-1 Activity baby walker has developmental activities that both you and your baby will love. You can convert it from a seat-in activity walker to a walk-behind walker, so you have a two-in-one baby walker. Toys include a spinning ball, a bead bar for developing motor skills, and a flower mirror toy with crinkle petals and a textured stem. The high foam seat back offers more support and comfort and is machine washable. Other features include skid-resistant friction pads, adjustable height, and front swivel wheels for easy maneuvering. One happy user said it is the best and safest in its price range, and that it transitions to a frontal push walker as baby grows older. However, a dissatisfied customer said it isn’t suitable for big babies, while another said it isn’t mobile and the back wheels barely move. The Joovy Spoon Walker is a combination of a baby walker and highchair. It provides the perfect balance for learning to walk while playing and eating. It features a super-sized tray with a removable insert that is easy to clean in the dishwasher. The extra large tray also provides enough room for your child’s toys, plus its bright color and glossy finish gives it a premium styling. Its padded seat is both supportive and comfortable, and also machine washable. 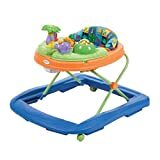 Positive reviews say this baby walker works great, is safe and supportive, has vibrant and rich colors, is easy to set up, and has warranty tags. Critical reviews say that the walker’s rear tapers, is a bit overpriced, and the table/tray seems too big. With the Bright Starts Juneberry Delight Walk-A-Bout walker, fun comes first. It features a removable electronic toy station for endless enjoyment. Also included is a steering wheel that activates sounds (with volume control), lights, and melodies to keep baby entertained. Its high seat back provides support and comfort and has three adjustable height positions, so it grows with baby. A happy user said it is an excellent deal for its price, and the volume function is great. Also, the fact that the toy station is removable and can be used separately on the floor or the go is good, plus it has an overall sturdy build. However, a dissatisfied customer decried the walker’s difficult assembly as frustrating, and it only works on carpets if you unscrew the rubber guards. Disney is synonymous with fun and entertainment, which is what this baby walker provides. 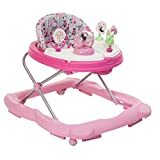 The Disney Baby Minnie Mouse Garden Delight Music and Lights Walker provides nothing but fun for your baby. It features an oversized play tray with four Minnie Mouse and friends toys, which swings open to form a snack tray. Also included are sturdy wheels that work on hard floors and carpets, plus grip strips to reduce movement on any surface. Its seat is padded and machine washable, so very easy to clean. One reviewer who gave positive comments about this baby walker said its quality is good, it is easy to set up, and entertaining. A critical reviewer said the walker wasn’t as good compared to its price, and the global attachment can jam babies’ fingers. Another said it isn’t practical to close up and store away, plus the trays aren’t practical either. The KidsEmbrace Batman Baby Activity Walker reeks of fun and adventure. Your child (especially little boys) will enjoy playing with the multiple interactive elements on this walker. It is made of polyester foam, covered with polyester batting for extra support and durability. Its cover is machine washable, easy to remove and wipe clean. Height adjustability is available in three options that lock into place, plus a high backrest for support and comfort as baby grows. The activity tray has a start key to make the Batmobile’s engine run and turns on the lights and shifter, which has multiple sounds and vibrates. Positive reviews say this baby walker is easy to set up, outstanding and has good height adjustments. Critical reviews say it is a safety hazard as the piece that locks the height snaps and can cause injuries. The Kolcraft Tiny Steps 2-in-1 Activity Walker offers the best value for money compared to any of the other walkers we reviewed. It is affordable, has an adjustable height, is convertible and grows with your baby. The KidsEmbrace Batman Batmobile Baby Activity Walker with Music and Lights really stands out regarding its cool looks — car-crazy kids will love it. Finally, we love the Safety 1st Sounds ‘n Lights Discovery Walker for its innovative twist and great features, including the activity trays. As with any device you choose to use with your child, it is always best to check with their pediatrician to see what they recommend. Have you used any of these baby walkers before? If so, share with us your experience by leaving a comment in the box below. We’d love to hear from you!